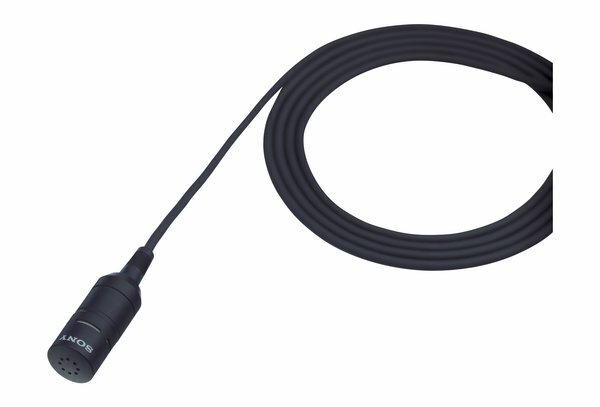 With its ability to reject ambient noise, Sony's ECM-66B Uni-Directional Electret Condenser Lavalier Microphone is ideal for presentation applications. Features include a mic head that weighs only 0.25 ounces, a black finish, and a two-way powering system giving users the choice between an AA-size battery or external power supply. 130 dB SPL maximum input sound pressure level. 130 dB SPL maximum input sound pressure level. Complete with in-line battery unit for 2-way powering. Complete with in-line battery unit for 2-way powering. Frequency response: 70 to 14,000 Hz. Sensitivity (0d B=1 V/Pa, at 1 kHz): -50.0 dB � 2 dB. Dynamic Range: Equal to or greater than 101 dB. Signal-to-Noise Ratio (A weighted, 1 kHz, 1 Pa.): Equal to or greater than 65 dB. Wind Noise (w/wind screen):Equal to or less than 50 dB SPL. Battery Life: Approx. 300 hours.